Tiffany Soohoo, left, and Karina Campos stand in front of their billboard in downtown Syracuse. It was more than a year ago that the Connective Corridor issued a challenge to SU students: Design a large-scale public art project for a billboard series to be displayed over the 2014-15 academic year next to the Nancy Cantor Warehouse in downtown Syracuse. Use it to showcase campus-community connections. Make it interactive through a social media platform to spark conversation and engagement. Students across disciplines formed teams to create imaginative proposals around the theme of connections. But one group stood out, led by Karina Campos ’17 and Tiffany Soohoo ’17. Their concept, “We Are Syracuse,” was based on composing a set of stories about people—both on campus and in the community—who make Syracuse unique. Their technique was equally creative. Pick a powerful word each month, and then set off on a journey across Syracuse to find people who embodied that word. Interview them and tell their story, using convergent media, with bold design, strong graphics and striking photography. Invite the community into the conversation to learn more. Now, a year later, Campos, Soohoo and their team of photographers and videographers are seeing the results in a very big way. The letters are held up by people whose faces are obscured. By visiting the website http://www.wearesyracuse.com, you can read a fuller story about the people and organizations they represent. For example, March’s billboard, “Spirited,” features, among others, David Holder of the Syracuse Convention and Visitor’s Bureau and Terry Baker of Syracuse in Focus, among others. A number of Syracuse University student leaders have also been featured in the series. 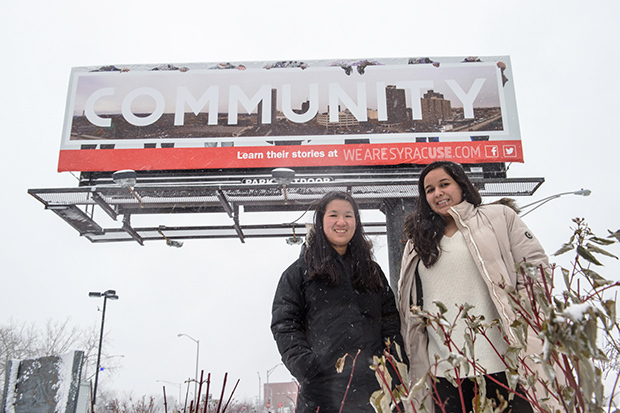 Soohoo and Campos say that their favorite part of the project has been learning more about Syracuse and connecting with the community. “It’s an amazing experience to learn about the city that I have been living in for the last two years,” Soohoo says. “This billboard project has definitely taken me to visit some great locations around Syracuse. There are secret hidden gems all around the city,” adds Campos. The multidisciplinary skill sets make for a richer perspective. Mentoring them has been Quinton Fletchall ’13, G’15, Connective Corridor program coordinator, who is also a part-time VPA instructor of design, a graduate student in communication and rhetorical studies, and a graduate of industrial and interaction design. Ultimately, as they tell the “We Are Syracuse” story, Campos and Soohoo have found themselves becoming the heart of it.